Sky Sports Main Event is part of the Sky Sports family of channels recently launched and re-branded. Sky Sports Main Event channel is dedicated to broadcasting the biggest live events from across the Sky Sports channels. It is available to customers with subscription to the full range of Sky Sports channels. This new channel will provide 126 Premier League live matches across Monday nights, Friday nights, Saturdays and Sundays throughout the season. This new channel will offer a new weeknight debate show as well as dedicated club programming including interviews, documentaries, behind-the-scenes access, news and highlights. 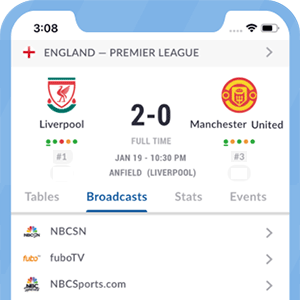 To supplement the live programming, you can access enhanced live features on the Sky Sports app. *Got itLive Soccer TV does not provide Sky Sports Main Event live streaming. The information provided on this page is simply Sky Sports Main Event soccer TV schedule.